The New York Times Magazine published a story “Ice Free” by Stephan Faris, hawking his new book “Forecast: The Consequences of Climate Change, From the Amazon to the Arctic, From Darfur to Napa Valley”, to be published in January. There is little recognition in the media and by the author of history. Greenland actually was warmer in the 1930s and 1940s than it has been in recent decades. For the period from the 1960s to the 1990s, temperatures actually declined significantly as the Atlantic went through its multidecadal cold mode. 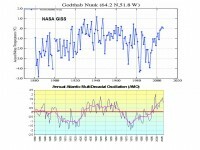 The temperature changes up and down the last few centuries were closely related to these multidecadal ocean cycles. Shown below is the temperature plot for Godthab Nuuk in southwest Greenland. Note how closely the temperatures track with the AMO (which is a measure of the Atlantic temperatures 0 to 70N). It shows that cooling from the 1940s to the late 1990s even as greenhouse gases rose steadily, a negative correlation over almost 5 decades. The rise after the middle 1990s was due to the flip of the AMO into its warm phase. They have not reached the level of the 1930s and 1940s. Temperatures cooled back to the levels of the 1880s by the 1980s and 1990s. In a GRL paper in 2003, Hanna and Cappelen showed a significant cooling trend for eight stations in coastal southern Greenland from 1958 to 2001 (-1.29ºC for the 44 years). The temperature trend represented a strong negative correlation with increasing CO2 levels. Dr. Howat in a follow-up interview with the New York Times went on to add: “Greenland was about as warm or warmer in the 1930’s and 40’s, and many of the glaciers were smaller than they are now. This was a period of rapid glacier shrinkage world-wide, followed by at least partial re-expansion during a colder period from the 1950’s to the 1980’s. Of course, we don’t know very much about how the glacier dynamics changed then because we didn’t have satellites to observe it. However, it does suggest that large variations in ice sheet dynamics can occur from natural climate variability.” For more on this issue see this full post here. SPPI has also posted a response here. EPW compiled a series of papers here.